The Great Ranges Fellowship is a leadership giving membership for donors wishing to support American Alpine Club programs with $1,000 or more annually. GRF members enjoy timely “insider” communications, custom swag, invitations to VIP events nationwide, and priority recognition in the Guidebook to Membership. At the AAC we value every gift—no matter what its size. In recognition of our most generous donors, we've created this program. Make a monthly reoccurring donation of $85, or more, and you will be recognized as a GRF member today! Insider communication regarding key Club issues. All the benefits of Teewinot, plus: a special hardcover edition of the American Alpine Journal. A one-week stay for two people at an AAC campground (subject to availability) NEW! All the benefits of Robson, plus: two (2) one-year AAC gift memberships to share with your friends and family. 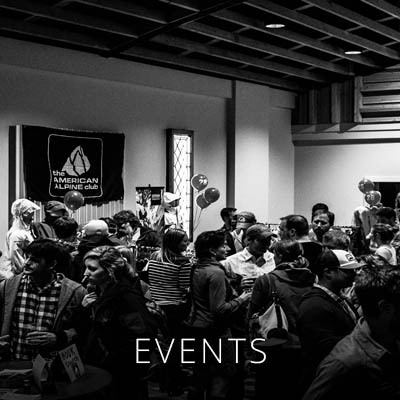 Two Weekend Passes + Clinic Registrations for a Craggin’ Classic of your choice NEW! All the benefits of Alpamayo, plus: two additional (four total) one-year AAC gift memberships to share with your friends and family. One-year Global Rescue International Travel Membership trip voucher (restrictions apply) NEW! VIP table for six at the Annual Benefit Dinner NEW!